Gimme a break…I hope it’s not a fracture! I’m really hoping it’s not a fracture, but my left foot is certainly bothering me. After my first run with the new Bikilas, my foot was slightly sore on top. I thought I might have had the strap a little tight. I hardly dwelled on it until the next day when I put the shoe back on. I made sure the strap was loose for that run. The next day, I went back to barefoot and remember some mild soreness. Having totaled 16 miles in 4 days, substantially more than I’d done since starting barefoot in January, I took a few days off. On Sunday, I had one of the most delightful 6 mile runs ever. (My previous blog said 5.5 miles, but I re-checked.) 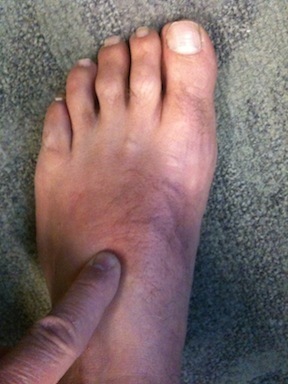 I was pain free until a few hours after when I felt a little ache on top of my foot. I iced it a couple of times. Monday morning it was worse, and I was limping. So, I’ve laid off the running and have been icing like crazy. It’s improved, but still feels like I should not run on it. From my research, the location suggests a possible stress fracture of the 3rd metatarsal, but I’m not convinced. Direct pressure doesn’t hurt much and wiggling my middle toes does, so I’m thinking/hoping it is ligament related. Not sure how it could have happened; I certainly don’t blame the Bikilas. My best guess is that I just stepped up the distance and frequency too quickly. The irony is that my Achilles tendons, which have been giving me fits, are now feeling terrific. I’m still hoping to run Saturday with my Metro Boston Barefoot buddies, who are doing a fun run on my home turf through the national park in Lincoln. Cross fingers. This entry was posted on April 27, 2010 at 7:30 pm and is filed under Barefoot Running, Experience. You can subscribe via RSS 2.0 feed to this post's comments. Sorry to hear about the foot pain 😦 It’s always best to just to take some time off when you’re worried about a stress fracture or something…who knows if it’s close to the “straw that broke the camel’s back” kind of thing. You don’t want to push it that ONE extra mile that causes the stress fracture. Good luck though! I just finished my last long run before a half-marathon on Sunday and my feet are a bit sore (ran in VFF Sprints), especially a bit more at the base of my middle toes on my left foot, but I’m hoping they’ll be fine! Hi Phil, sorry to hear about your foot! But glad to hear your Achilles is doing better:) I’m not sure if this is similar, but at one point during my training I had to swap out a pair of my vibrams for a new pair because there was a defect in the stitching. I started right where I left off in the new pair and I felt OK, until a few hours later when I noticed a similar pain in my right foot. It took a few weeks of cutting down my running for it to go away, but it eventually did. I know the vibrams seem comfortable, but I do think they need some breaking in. Perhaps your Bikilas just need some break-in time? At any rate, I hope you feel better soon! Thanks. Feels a little better today. Will keep you posted. Turns out, TOFP (top of foot pain) is not that unusual for barefoot runners…and VFF wearers. Not clear what the cause is. I’ve cut back a little on running and it’s consistently improving. And my Achilles tendons are pretty good as well. I thought I had a stress fracture as well, but it turned out to be tendonitis along the top of my foot, in exactly the same spot that you’re pointing out. Happened quickly. After two weeks of no running, lots of ice and arnica, I was able to start back up again with no pain. Times like these, I wish I kept a detailed running log. I did do a 300′ vertical hill around that time, but I don’t remember exactly where that run fell relative to my TOFP. I backed off a notch, but didn’t take two weeks off as you did, and it gradually went away. Not trace at this point. Hi, Just reading this post as I have same injury/pain at the moment. Did it ever recur and 4 years on what are your thoughts? I took it a little easy, the pain stopped–frankly I don’t remember how quickly, but I think a week or two. And, have never recurred. I continue to run barefoot (no shoes of any kind) about 15 miles per week.